There have been a few changes since our last visit to Dartington. We usually come here in spring or summer, in search of new flowers and butterflies. So to see the trees bare like stripped giants takes some getting used to. As does the new policy of car parking charges. While they are not the most extortionate in South Devon, you wouldn't want to come here on a daily basis. We could have turned round ,of course but our hearts were set on walking along the lane and into the woods beyond, examining those bare-looking giants for layers of lichens. 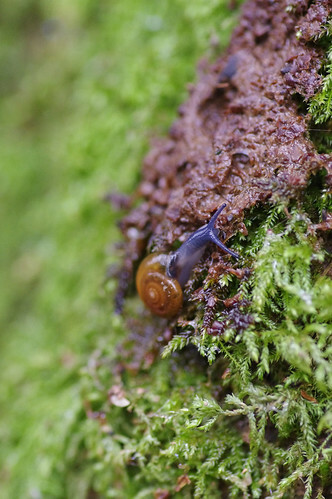 There is an unusual way of telling two very similar Pertusaria species apart. By wetting your finger, rubbing it over the surface and tasting it, you will have your answer. 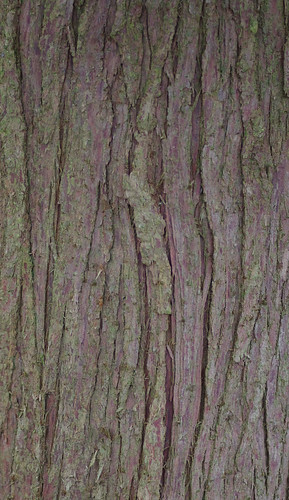 If the specimen in question is an example of Pertusaria amara you will have an unpleasantly bitter taste in your mouth. 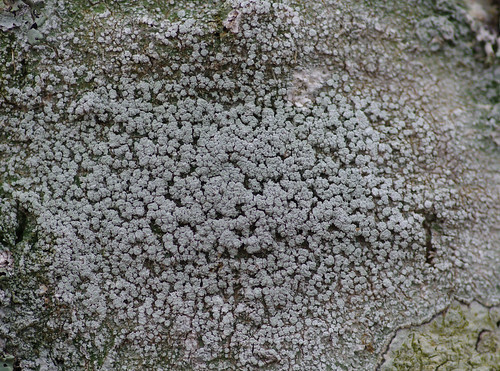 Pertusaria albescens lacks the bitterness. We found this on a wall, covering a relatively large surface area. What's most confusing here is the presence of conflicting discs on the surface. There are tiny, uniformly white discs but there are also miniscule black or dark brown discs with white margins. I wonder if this means there are actually two species present and not one. 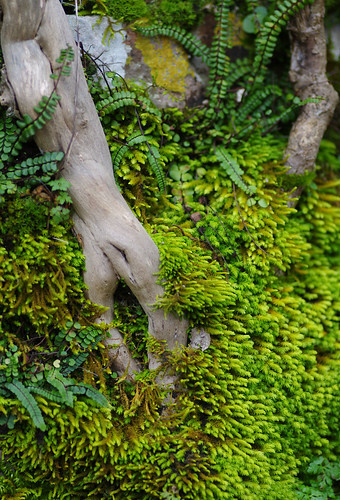 The worn, twisting trunk and the mosses growing around it have produced an interesting texture. There are Maidenhair Spleenworts (Asplenium trichomanes) sticking out to the left and in the background. Further along the lane the wall cleared and we began to see different individual species we had not recorded previously. I could have sworn this was Frizzled Pincushion. But the image above lacks the characteristic groups of brown gemmae among the tangled leaves. 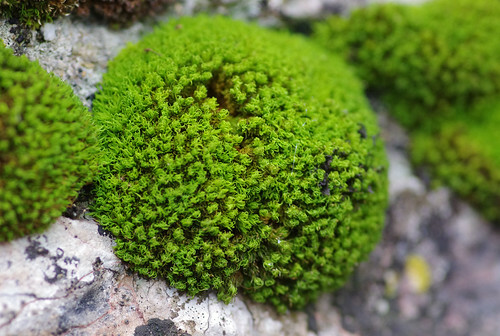 So I am opting for Frizzled Crisp-moss (Tortella tortuosa) instead. 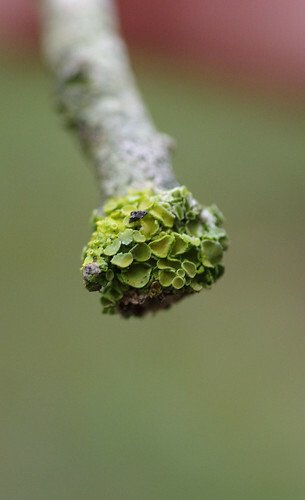 Its leaves are similarly tangled, with some hooked at the end while others are bent right over to form a spiral. 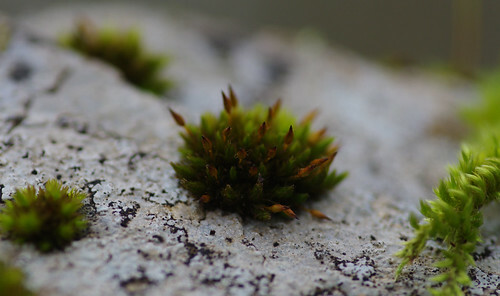 The stone wall was proving an ideal hunting ground for mosses. Without the heavy field guides to hand we had to rely on memory (racking our brains to try to remember those species we had seen before) and using our instincts to pick the most distinctive-looking specimens that would hopefully be easiest to identify afterwards. Yellow Feather-moss (Homalothecium lutescens) is the closest match to anything in the field guide. But mosses are proving more inconclusive than lichens. In truth there could be a score of culprits vying for a spot on our species database! 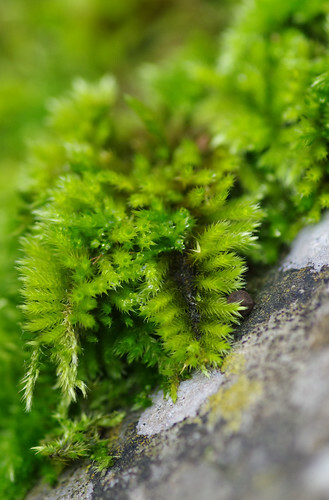 (as opposed to some other bristle-mosses where the capsules are nestled amongst the leaves). This species is frequently found on stone walls and gravestones. The white layer underneath is not the rock surface. 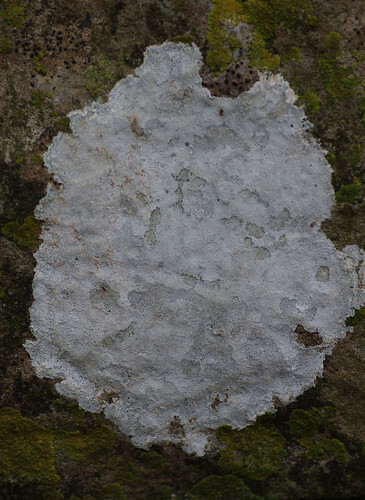 It is yet another lichen! 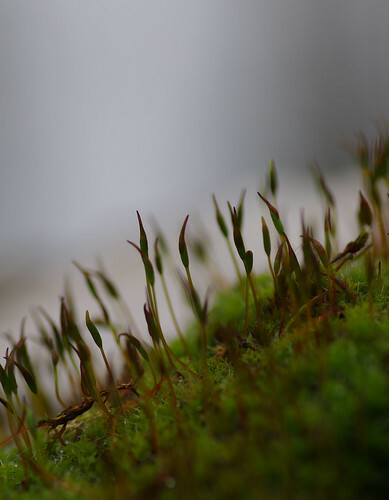 The fruits of this moss produce an effect of dancing flames. We've been seeing these forms regularly on stone walls a lot recently so I can only assume it's a common species. 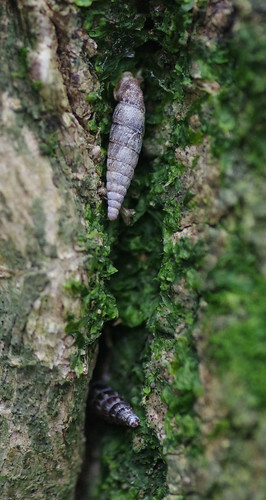 This was situated on a tree trunk. At about this point we cut through a gap in the stone wall and entered a wood. Some of the trunk patterns were particularly striking and well worth recording. We should have looked up to gain a sense of the tree's height and form. That's part of the trouble of being blessed (or cursed) with a butterfly mind. There's that unshakeable kid-in-a-confectionery feeling where you just want to sample everything and anything. Sometimes you even forget to look where you're going. Sherry had a headache before accidentally brushing up against these leaves and soothing the pain. I should have asked her if the leaves smelled of parsley but I did not have the guidebook to hand. This was on the same tree as the image of the trunk. 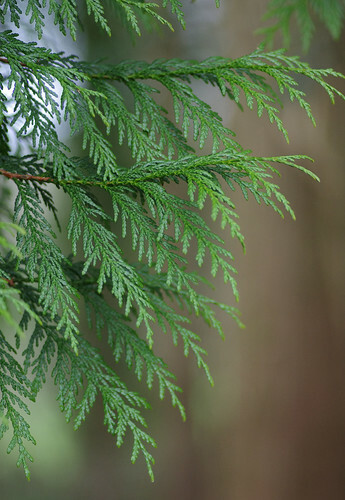 It's a sort of cedar or cypress (or maybe even a Japanese Thuja) but with hundreds of different varieties and planted hybrids I shouldn't feel too deflated. I must endeavour to be more scientific, to carry each experiment through to its conclusion. And try not to be in so much of a hurry. Next time I will think to examine the underside of the leaves as well as how they appear from above, and to look for cones: two factors which might bear better results. 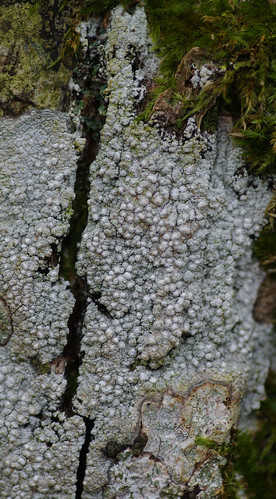 We can't go anywhere these days without seeing lichens at every turn. It makes me think of all those years when I failed to notice them or ignorantly passed by. It feels like a whole new dimension has opened up; a dimension that's a pleasure to experience but often perplexing to comprehend. 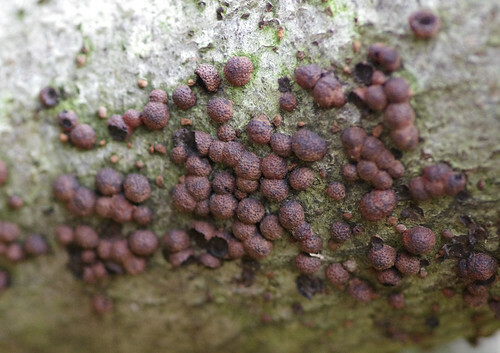 The one above had a dark green thallus and black, nobbly warts. A distinctive enough combination, or so I thought. As yet I have been unable to find a match. 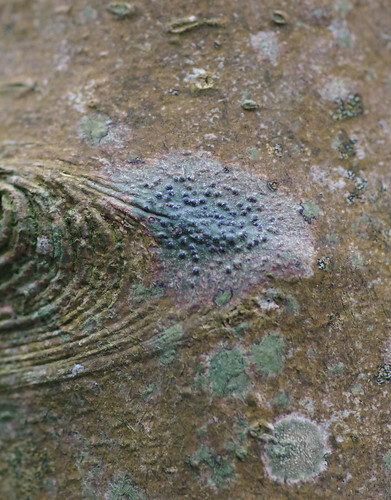 There is a plethora of organisms waiting to be discovered in the niches and crevices of trees. As I'm looking at this image I imagine a couple who have had a disagreement and are keeping their distance for the time being. The folk who are responsible for maintaining this wood have done a great deal for biodiversity. There are a number of log piles, branches and trunks of various trees, allowed to degrade and rot naturally over time. And where fungi are given a window of opportunity they do not stand on ceremony. 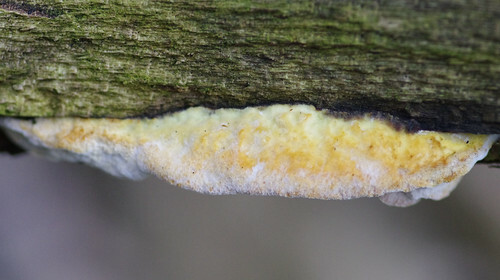 This unknown fungi had crimped edges a bit like a pasty poorly turned out. I've seen something like it before. 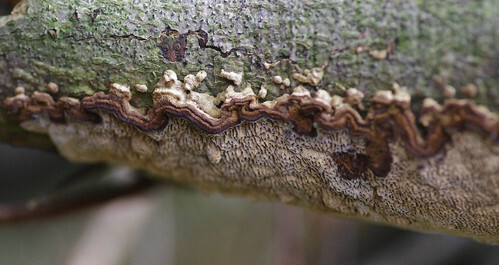 I don't think it's a mazegill because the underside has irregular stalactite-type forms. We were coming across new mysteries by the minute. With each successive log it seemed there was some new fungal form to perplex us. And so we pressed on to clear our heads, to examine the ground between log piles. There was nothing of note at first. I swept my boot across the ivy and in the soil found a couple of Orange Peel fungi. Unfortunately, the camera was in an uncooperative mood and the finished results were not quite up to scratch. Better luck next time I hope. 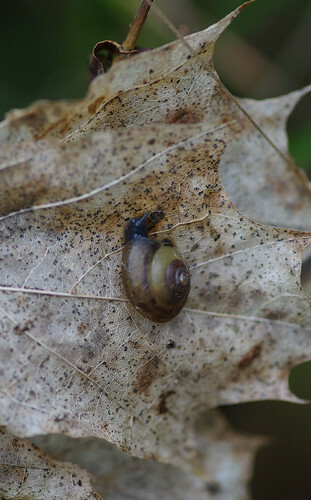 This snail's shell has the requisite three and a half whorls, a dark edge and is in the right habitat. The pinkish light at the top of this image is actually from my hand holding the twig up. By doing so the background light is far more pleasing than it would have been pointing down to the ground. We cut through the wood back to a path bordering a field and a stone wall and began our leisurely return, looking for new species along the way.